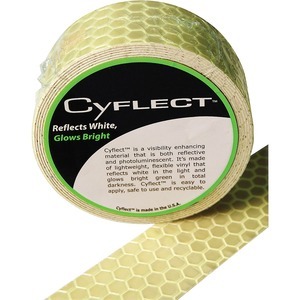 Adhesive tape features a honeycomb design and a visibility-enhancing material called Cyflect that is both reflective and photoluminescent. Lightweight, flexible vinyl reflects white in the light and glows bright green in total darkness. Tape is easy to apply, safe to use and recyclable. Tape retains adhesive qualities when wet.